The fine folks over in Atlanta have just announced their code camp will take place on March 29th, 2008. I’ll be submitting several sessions, and look forward to a good time. Last year was a lot of fun. To sign up head to http://www.atlantacodecamp.com/ and I’ll see you there in a month! Well, I set out tonight to do some more studying of PowerShell, my new love in life. Then I intended to create a blog entry, but a Twitter post reminded me of something I’d seen on the Hanselman Forums, and next thing I know I’d sucked up my alloted time over there. Most of what I posted was in these threads: Productivity Tools, Hanselminute Shows, Off Topic and Philosophy of Software. I can’t leave without passing along at least one PowerShell related tip: I’ve been listening to the PowerScripting Podcast all week. They’ve had 19 shows so far, I started at 0 and am up to number 8. Very good stuff, lots of links to PowerShell tools and tips. One reason it’s taking me so long is I keep stopping to make notes or check out some link they give. Most geeks I know tend to be workaholics. We go and go and go on a subject, spending long hours in front of our PC’s until we’ve conquered whatever we’ve been working on. It’s important though to avoid getting burned out. When we’ve exceeded our capacities, we’re depressed, dread looking at things, our productivity goes to near zero and stress wreaks havoc on our health. For the last two months I’ve been hammering away at SQL Server, getting ready for my presentations at the recent code camp. While I’m not quite at the burn out stage, I recognize it’s just around the corner and decided I needed a break. At the same time I came away from code camp energized and wanting to learn something “techy”. The answer then was obvious, to find some technology that was new to me, and that I could use in conjunction with my SQL Server work, but was not directly SQL Server. I twittered about going to the bookstore on Sunday, what I was actually looking for was a book on F#. (Yes, I’m an old fogey and still like books as a good platform for learning.) F# seems to fit well with processing sets of data. Sadly the stores lacked any tomes on the subject. 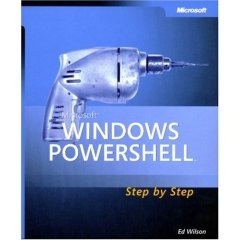 I did find, however, a book called “Windows PowerShell Step By Step”. This looked like a great fit for my needs. It’s small, around 220 pages so it’s something I can easily read in a short amount of time. It’s on a subject I was interested in, PowerShell. I believe PowerShell will soon become an integral part of all Server based technologies, and we’ll be able to perform remarkable amounts of maintenance and more with PowerShell. Over the next few days I’ll give some more resources for PowerShell that I’ve already found, but I can tell you I love PowerShell already. My post for today is not so much about PowerShell but about burnout. When you’ve spent a lot of time hammering away, don’t forget to come up for air every so often. Look around, see what other tools are available for you to learn. You’ll find yourself refreshed, and have new skills to boot! I love code camps. They are nerd nirvana combined with the glorification of geekdom in one fabulous fun filled day. I always come away energized and ready to dive into the tech world. The recent Alabama Code Camp in Huntsville was no exception. Big public congrats to the Huntsville User Group for putting on a great camp! My favorite part of code camp is the speakers dinner, traditionally held the night before. It’s a chance for the organizers to go over any last minute details with the folks who will be speaking the next day, and a chance for us to catch up or meet new people and generally geek out. After the speaker dinner a group of us went over to… well let’s just say the place is known as being “delightfully tacky yet unrefined”. We wanted to grab a few adult beverages and continue some of the discussion. You know, I never thought that particular chain of all places would be “closed down” by a bunch of geeks, but sure enough by 1:30 am the girls in the orange shorts and white tank tops were gently pushing us toward the exit. At some point, I think it was around 12:45, I sort of realized we were the only group left in the place but there was a rather spirited debate going about SOAP vs REST as well as some discussion of LINQ so I wasn’t paying too close attention to the surroundings. It was an interesting crowd, Doug Turnure (who to his credit had enough brains to leave about 11 and get some sleep), Jim Wooley, Michael Neal, Alan Stevens, Keith Elder and myself. Keith and Alan were giving Doug and I grief about not being on Twitter. I had taken a look at it some point back and guess I didn’t invest enough time with it to see the benefit. That night I believe it was Keith who described it as “being in the speaker’s lounge, all the time”. After that and a bit more verbal “nudging” Doug and I both dusted off our accounts. I spent a few minutes when I got back to the hotel actually reading the on-line instructions (what a concept, reading the fine manual) on how to use Twitter. Now after following it for a day or so I’m getting an inkling of how this could be useful. I’m going to give it a shot during the week and see what happens. If you don’t know anything about Twitter, head over to http://twitter.com and take a look. Be sure to read the FAQ so you get an idea of how to use it, then jump on in. I’ll pretty much follow anyone who is following me, so feel free to add me or leave a comment below with your twitter info. Now if you’ll excuse me, I need to Twitter the fact I just updated my blog! My third and final presentation for the Alabama Code Camp 6 is “Introduction to SQL Server Full Text Searching”. Here are the materials I’ll be using during the demo. Next, most of the demos used SQL statements. This PDF file has all of the SQL plus some associated notes. My second post of the day at Alabama Code Camp 6 in Huntsville is “Introduction to SQL Server Integration Services”. The “cheat sheet” or script I used to do the demo is here: Script for doing the SSIS Demo You can step through it to recreate all of the things I did in the demo today. In case you’re wondering why the slowdown in the blog this week, I’ve been spending all my free time getting ready for Alabama Code Camp 6. My first presentation of the day is “The Developer Experience”. It’s chock full of practical, low cost (or even free!) ways to make your life as a programmer more productive.